Moon Neo Mind promises to stream music from almost any source | What Hi-Fi? The Neo Mind can play lossless files up to a 24-bit/192kHz resolution, as well as streaming from Tidal, Deezer and Qobuz, and playing music over aptX Bluetooth. 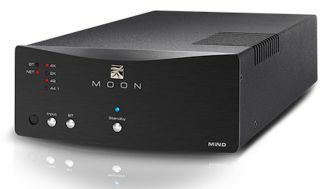 Moon has announced its latest music streamer, the Moon Neo Mind (Moon intelligent network device), which promises to stream music from pretty much any source and will look to repeat the success of the impressive Moon Neo Ace all-in-one system. You can connect via Ethernet or Wi-Fi, and it will stream from subscription services including Tidal, Deezer and Qobuz. You can also send audio via aptX Bluetooth from a smartphone, tablet or computer. NAS drives, plus DLNA and UPnP devices, are also supported. When it comes to connecting to your hi-fi, the Neo Mind can output via any one of its three digital audio outputs (optical, SPDIF and AES/EBU). The streamer is able to play WAV, FLAC, ALAC, AIFF, AAC, MP3, WMA, and Ogg Vorbis files, up to high-resolution 24-bit/192kHz - and you'll always know what resolution is playing, as well as which input you're on, thanks to the LEDs on the front. It also supports Simaudio’s SimLink connection, allowing the Neo Mind to connect to existing Moon products and give you complete control of your system. The Mind control app is available on Android and iOS, and there's also an IR remote. Available now, the Moon Neo Mind is priced at £1700.